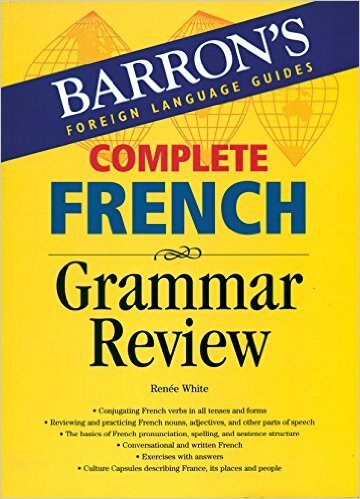 Description Barron's Complete French Grammar Review Students of French will find a comprehensive summary of grammar and correct usage in this book. It begins with a review of French pronunciation and spelling. It then goes on to analyze all verb tenses and forms. Following chapters cover articles and nouns, adjectives and adverbs, personal, possessive and demonstrative pronouns, comparative and superlative forms, negative forms, the interrogatives, numbers, dates and time. Grammatical tips, tables and crossword puzzles are interspersed throughout the text and exercises in every chapter will help you sharpen your understanding of French grammar. The book's added features include- Culture Capsules in French throughout the book, describing interesting aspects of French Culture. They're supplemented with a bilingual glossary. Exercises with answers in each chapter. Word Lists and Verb Charts at the back of the book.